Fashion Notebook: Lessons in Branding: Why Isn't Missoni Playing Up Green Aspect of Collector's Edition "Aqua" Bottle? Lessons in Branding: Why Isn't Missoni Playing Up Green Aspect of Collector's Edition "Aqua" Bottle? We talk a lot about "green" these days, so much so that we have to be careful that we're not misusing the buzzword, and that we suss out the veracity of its usage in the numerous releases that come across our desk each day. 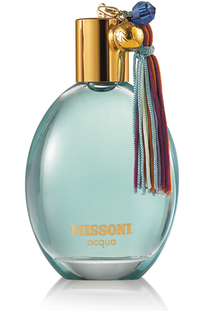 But today, in a notice about a new collector's bottle for Missoni's land- mark "Missoni Acqua" fragrance, we also have to watch out for when we don't see the term used when it could so readily apply. The bottle, which Angela Missoni sez was inspired by "the colors and textures of the Missoni scarf," is meant to be a collector's bottle that will "bring a touch of color to every woman's day." OK, well, wee see those inspirations, the multi-hued tassle and the iconic zig-zags cut into the metal ball that adorns the atomizer cap. The bottle is rather classic looking, if not bowling us over with design, and we could definitely see it fitting easily and comfortably on a vanity table, in a purse, or in checked luggage (mind those ounces, ladies!). But what seems to be downplayed here is that, as a collector's bottle that the customer would allegedly wish to keep around longer than the life of the liquid fragrance it contains, the thing is refillable. Which means of course less waste given that consumers would actually go to get the bottle refilled rather than just buying a new box. This is the stuff of green people! The kind of thing that marketers everywhere are desperate to communicate about their brand. So why isn't Missoni doing it? Well, perhaps it's because they don't want to invite further scrutiny of the rest of their line, which likely isn't comprised of eco-friendly materials or manufacturing processes. After all, there is definitely a movement to have more investigation on green claims these days and who wants to be investigated by consumer advocacy groups pining for a bloody production story or a disproof of claims? Anyhow, we feel this is a missed opportunity. Check out this latest Top of Mind from our print sister, Brandweek's, Robert Klara, a funny riff on green initiatives that actually save companies money and, more importantly, help build some good will with consumers.